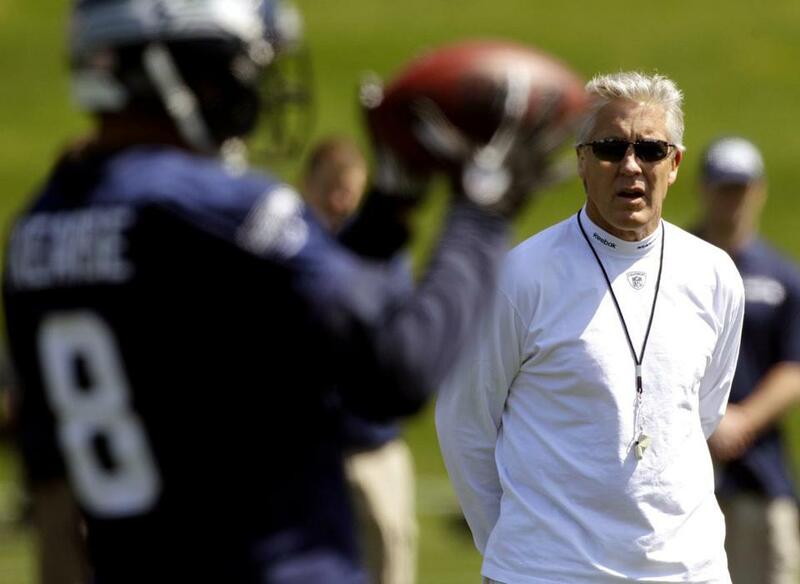 In 2007, then-Southern Cal coach Pete Carroll (now with the Seahawks) and then-NFL Players Association executive director Gene Upshaw combined forces in an attempt to keep agents off the backs of talented underclassmen. Agents seeking to represent college football players are operating under two new rules that could help curb illegal activity - but only if there is more vigilance with enforcement. The first change was to get rid of the “junior rule,’’ which prohibited agents from talking to college juniors before their eligibility was up. It was a rule put in place in 2007 when then-Southern Cal coach Pete Carroll (now with the Seahawks) and then-NFL Players Association executive director Gene Upshaw combined forces in an attempt to keep agents off the backs of talented underclassmen. The rule was bad for two reasons. First, certified and experienced advisers who could actually help players make an informed decision about whether or not to turn pro weren’t allowed to have contact. Second, it opened the door for people in the background - like runners, who work off the ledger for agents to gain access, plus marketing agents, uncertified agents, and financial advisers - to influence players. So the NFLPA, now with DeMaurice Smith as executive director since Upshaw’s death, wisely repealed the rule. The book, which is not kind to Carroll, the former Patriots coach, goes into much greater detail. And it surprisingly and coherently offers several different ways to clean up the recruiting process at every level of football and oversight, from the colleges to the federal government. But at least now things will be a little bit more out in the open. The other rule change by the NFLPA may, unfortunately, do the opposite. Certified agents are now prohibited from “using, employing or entering into any business relationship with any individual in the recruitment of prospective player-clients who is not certified and in good standing’’ with the NFLPA. Basically, the rule is supposed to eliminate the use of illegal runners. In theory, it’s a good step. Runners, who could be college classmates or high school friends, are some of the worst sorts in the sordid business of recruiting. But unless the NFLPA is planning on increasing its staff for enforcement, or using a different avenue for finding violators than just disgruntled agents or burned runners, then the practicality of the rule is up for debate. “It’s not difficult to enforce - it’s freaking impossible to enforce,’’ Luchs said. “It’s indicative of NFLPA leadership being completely out of touch with how things really work in the recruiting process. The biggest problem is that many agents get their future clients from a current client who sells the player on the agent. Sometimes those recruiting players do so in exchange for a decrease in the percentage the agent receives on a contract. Technically, those players are now supposed to be certified by the NFLPA under the new rule. Good luck with that. Never mind the agents who represent college coaches and just happen to get most of their players when they turn pro. If you want better and more comprehensive solutions, look to Luchs’s book. One of the more interesting proposals is to allow agents to give prospects loans against future earnings while they’re still in college. It makes a lot of sense in that it puts something some agents were doing out in the open, it solves the question of whether to pay college athletes (and how), and it takes the NCAA off the hook from having to foot the bill. If you’re interested in how college and pro football really work, then pick up Luchs’s book. He worked with so many different agents in his career that he has seen it all - the good, bad, and ugly - and taken part in it. Oh, and did you ever wonder why former Ohio State star running back Maurice Clarett flopped after college? It’s all laid out in the book, and it involves an alleged Israeli mobster whom Clarett lived with, and a water bottle full of Grey Goose. The Ravens were dealt a jolt when defensive end Terrell Suggs, the reigning NFL Defensive Player of the Year after posting 14 sacks, seven forced fumbles, and two interceptions, had surgery to repair a torn Achilles’ tendon. The best-case scenario is that Suggs can return in some role by the end of the season and help in the playoffs. Not exactly the ideal scenario for Dean Pees in his first season as Ravens defensive coordinator after two years as linebackers coach. But Pees has experience dealing with the sudden loss of a marquee player. He was linebackers coach for the Patriots when Tedy Bruschi suffered a stroke in February 2005. The linebacker returned in late October. “You just go out there and you have to coach the guys that are here,’’ said Pees. “There aren’t any other choices. “I remember when they told me Teddy Bruschi had a stroke. Those weren’t exactly the words that I wanted to hear [about] my starting ‘Mike’ ’backer, but we put in somebody else. “Mike Vrabel, who had never even played outside ’backer, ended up playing Mike for us. I’m not saying he was great at it, but we had schemes and things that we could do until Bruschi came back. The Ravens, who also lost outside linebacker Jarret Johnson in free agency, will likely go with Paul Kruger, a second-round pick in 2009, at one of the edge spots, and 2012 second-round pick Courtney Upshaw out of Alabama on the other side. Pees also said Albert McClellan and Sergio Kindle have shown improvement on the outside. Head coach John Harbaugh believes Pees will get the job done, even without Suggs. “He is forceful, obviously,’’ said Harbaugh. “He is very confident. He has been doing this a long time. He is really creative. He is one of the better teachers I have ever seen as a coach. Disturbing new details surrounding the death of former Patriots linebacker Junior Seau were revealed last week in an investigative piece by USA Today that retraced his final days. The biggest revelation was that Seau, whose death May 2 was ruled a suicide by a gunshot to the chest, had trouble sleeping for years and often took the prescription sleep medicine zolpidem (common brand name is Ambien), and not as directed. While sleep disorders are associated with people who have dealt with concussions, the drug instructions say that patients with a history of depression should use caution. Users should not drink alcohol, which friends of Seau told the paper he did. And the drug should not be taken if you can’t get a full night’s sleep. This was often a problem for Seau, according to the report. “He told me he usually woke up around 1 or 2 and couldn’t go back to sleep,’’ Nancy Emsley, a friend of Seau’s, told the paper. She said she told Seau he needed to sleep for eight hours after he took the drug. “He just rolled his eyes,’’ she said. Former Chargers teammate Mark Walczak said he witnessed Seau taking the drug when Seau played for the Dolphins in 2005. The investigation into Seau’s death is expected to be completed next month, when the toxicology report comes in. The paper reported that the Seau family, some of whom have expressed doubt about whether he truly committed suicide, recently met with police investigators but neither side revealed what the conversation was about. Whether or not Seau’s brain was preserved to be studied has not been revealed. Seau’s daughter, Sydney, recently graduated from high school and will attend Southern Cal. She plans to play beach volleyball at her father’s alma mater. Seau’s son, Jake, 16, committed after his sophomore year to play lacrosse at national power Duke. The NFL Network has often been criticized because it is owned by the league and therefore its independent decision-making has been questioned. But two developments last week suggest the network is flexing its autonomous muscles. First, the network picked up a one-year option on the contract of analyst Warren Sapp. Two league sources said in April that Sapp was unlikely to have his contract renewed in the wake of his comments on Twitter and the network that former Saints tight end Jeremy Shockey was the “snitch’’ in the Saints bounty scandal. The Showtime program “Inside the NFL’’ dropped Sapp, who recently filed for bankruptcy. But NFL Network kept him, which came as a surprise to some in the league who thought there was an understanding that Sapp was done because his barbaric attitude is what the league is trying to distance itself from. The NFL Network and NFL.com definitely showed they are not house organs when they ran a full transcript of comments from Saints linebacker Jonathan Vilma, who is suspended for the season because of the bounty scandal. Vilma was critical of NFL commissioner Roger Goodell. 1. I’m all for players getting what they can when they can, but it’s ridiculous for Jets cornerback Darrelle Revis to say he doesn’t know whether he’ll report to training camp. The team just gave him a huge deal two years ago, and he made $32.5 million the first two years. When you get your big deal after holding out, the intention should be to honor it. Otherwise don’t sign it. 2. 49ers coach Jim Harbaugh looked foolish last week when he said it was “phony’’ that the team flirted with Peyton Manning before Manning signed with the Broncos. “We were evaluating him,’’ Harbaugh said. Yeah, OK.
3. Another fib: Dolphins coach Joe Philbin saying the team’s decision to do “Hard Knocks’’ on HBO was a “football decision.’’ Philbin used to work for Packers general manager Ted Thompson. Dolphins general manager Jeff Ireland is a Bill Parcells disciple. “Hard Knocks’’ is not in either mentor’s vocabulary. 4. The Patriots must be loving life. Two years ago, they got intel on the Jets through “Hard Knocks.’’ This year it’s the Dolphins. Guessing it will be the Bills’ turn next year. 5. Chicago said it would like to host the Super Bowl. Not in that stadium. Ever. Patriots right tackle Sebastian Vollmer has not been at organized team activities for precautionary reasons - to make sure his ankle, which was operated on last season, is 100 percent this time around as the team proceeds without retired left tackle Matt Light . . . Bills defensive coordinator Dave Wannstedt raved about the early work of former Patriots defensive end Mark Anderson. “The guy’s got extremely quick feet,’’ Wannstedt said. “I think as an edge rusher we’ll see how it unfolds. He’s really been interesting. I didn’t realize he has that good a first step, which you’ve got to have to be a really good pass rusher.’’ . . . In a rambling blog entry, Sean Pamphilon, the filmmaker who released the Gregg Williams bounty audio tape, said suspended Browns linebacker Scott Fujita admitted he had been involved in a bounty system when playing for the Saints. “I can’t believe I used to be that guy,’’ Pamphilon quoted Fujita as saying after hearing the Williams tape. Pamphilon also wrote that Saints quarterback Drew Brees and the NFLPA were on board with the audio being released as part of a strategy to pin the bounty scandal squarely on Williams . . . Former Boston College quarterback Matt Hasselbeck (Norfolk) has been splitting reps in Titans camp with 2011 first-round pick Jake Locker. Coach Mike Munchak wants to name a starter before the third exhibition game . . . With Los Angeles readying to reopen to an NFL franchise, the Vikings were able to get their new stadium. Next up: the Rams. This is also going to go down to the wire after the agency that runs the Edward Jones Dome, the Convention and Visitors Commission, rejected the team’s $700 million plan to renovate the facility. The two sides have until June 15 to strike a deal or they will go into arbitration. If the Rams and the CVC, which said public funding is capped at $60 million, can’t come to an agreement, the Rams could relocate after the 2014 season . . . Two Holy Cross players have received an NFL shot as undrafted free agents: Offensive tackle Mike McCabe (Watertown, Conn.) signed with the Packers, and cornerback Chandler Fenner joined the Chiefs. Tackle Aaron Jones, who graduated in 2010, was invited to Panthers rookie camp but hasn’t been signed. He participated in Saints rookie camp in 2010 . . . UMass has running back John Griffin (Westminster) with the Jets, guard Josh Samuda in Miami, receiver Julian Talley attempting to duplicate Victor Cruz’s success with the Giants, and long snapper Travis Tripucka with the Rams. The Eagles have former Minuteman tight end Emil Igwenagu (Boylston) listed as a fullback.